Drugs seized by Massachusetts State Police following a traffic stop. Massachusetts State Police say a routine traffic stop on Interstate 95 in Sharon has led to the arrest of a Rhode Island man on drug charges. A state trooper pulled over a 2008 Dodge Caliber at about 7:15 p.m. Tuesday in the highway's southbound lanes for failing to stay within marked lanes. 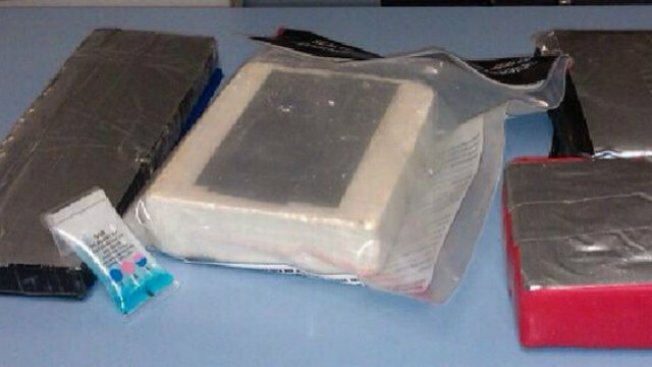 A search of the vehicle yielded approximately four kilograms of a substance thought to be heroin. Police say 29-year-old Alex Cintron, of Providence, Rhode Island, was arrested on charges of trafficking in heroin and committing a marked lanes violation. He was held overnight on $250,000 bail and is scheduled to be arraigned in Stoughton District Court on Wednesday. It could not be determined if he has a lawyer.